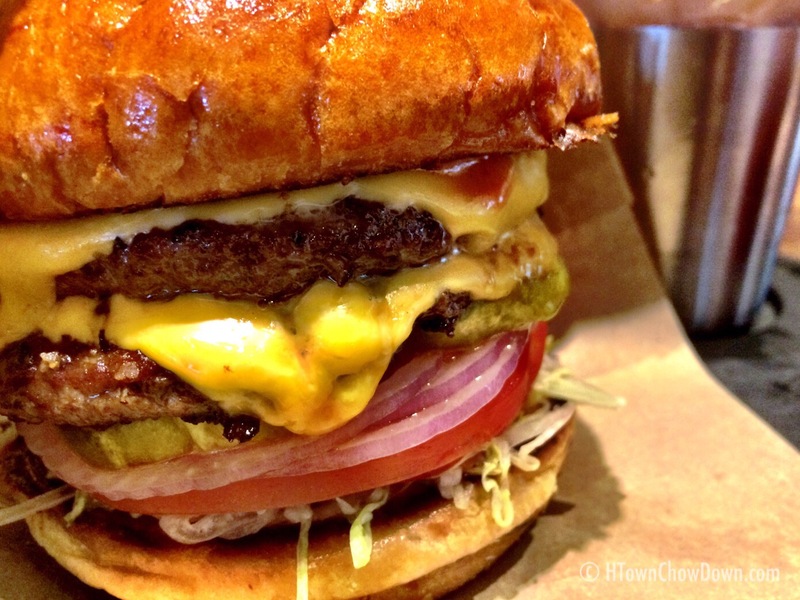 The Woodlands has become a popular location for successful Houston establishments looking to branch out into a new market. The combination of an attractive demographic and plentiful (if pricey) retail space brings many successful Houston restaurateurs to this bustling suburb to the north. The latest group to make the drive up I-45 are the team behind several successful bar and restaurant locations in Houston, including Pub Fiction, Celtic Gardens, Third Floor, Shot Bar, Bear Market, and Cook and Collins. They’ve brought their successful Heights restaurant concept, called Crisp, to the Woodlands. Crisp is an upscale, casual restaurant concept that is built around craft beer, a curated wine list, and chef-driven, but not stuffy, cuisine. Crisp is located in the original Black Walnut space on Research Forest. The cozy but dated Black Walnut interior was gutted, and a new, sleek, inviting interior was constructed. Several distinct spaces were created; an energetic bar area, a quieter, cozy dining room (divided from the bar by a wall of wine that is a beautiful focal point) and a comfortable covered patio. Lighting is subdued and cozy; it’s a comfortable setting for dinner with family and friends. We predict it will also be a popular location for date night. To this end, Crisp has eschewed the current trend of upscale counter service for traditional, full-service dining. We shudder at the concept of asking a date to wait in line to order, and applaud Crisp’s decision. The wine list is broad without being encyclopediac, and the staff is poised to make helpful pairings. A dozen craft beers are on tap, more are in bottles, and unlike the Heights location, Crisp offers a full bar in the Woodlands. 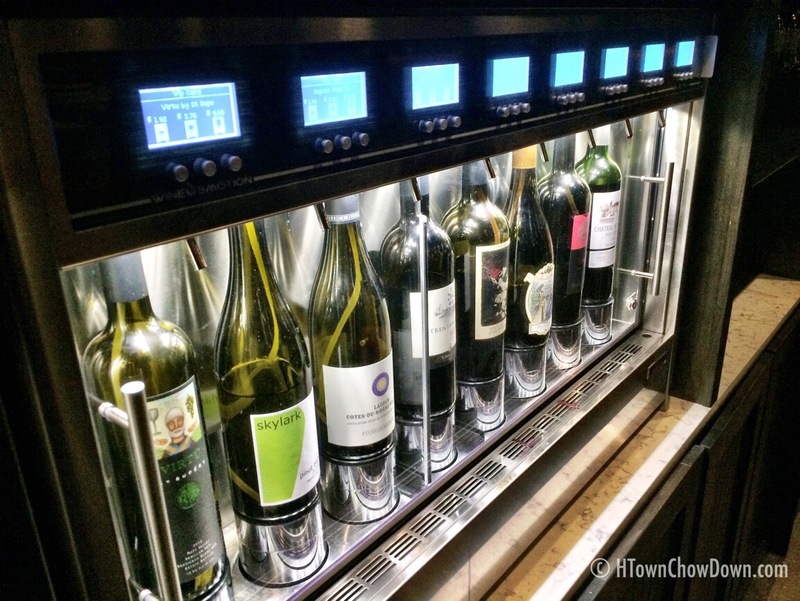 There are some interesting details, including one of the amazing Enomatic wine delivery systems, allowing guests to pour glasses of specialty wines typically not available by the glass, and in three serving sizes, including one-ounce tastings. An inviting setting with all the latest technology is great, but success in the restaurant business hinges on the food and the service. How does Crisp’s measure up? We started by ordering both sides of a traditional charcuterie tray – the Dairymaid’s Cheese Board and the Shady Acres Picnic Platter. 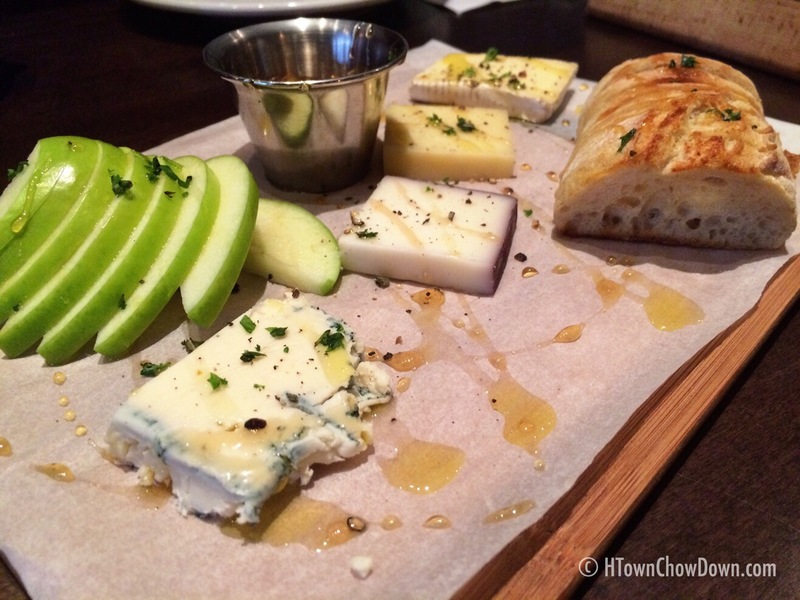 The cheese board features a small loaf of crusty bread drizzled with honey, a selection of four cheeses (presumably from Houston’s Dairymaid cheesemakers), apple slices, and honey. While we admire the choice of a local source for cheese, we were a bit underwhelmed with the choices here. None of the cheeses were bad, but flavors are muted and mild, and there wasn’t a “wow” cheese on board. As mild as the flavors were on the cheese board, we were pleasantly surprised by the bold flavors on the picnic platter. 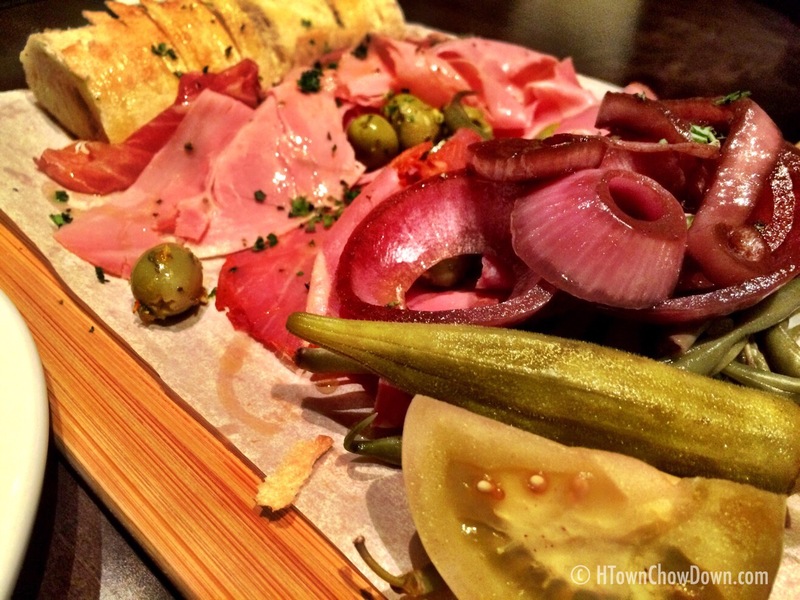 Very good proscuitto and salumi are presented with a selection of delicious pickled vegetables. The pickling brine is far more interesting than a traditional vinegar solution; sweet, spicy and complex, these vegetables outshine the very good meats and make this a craveable platter. 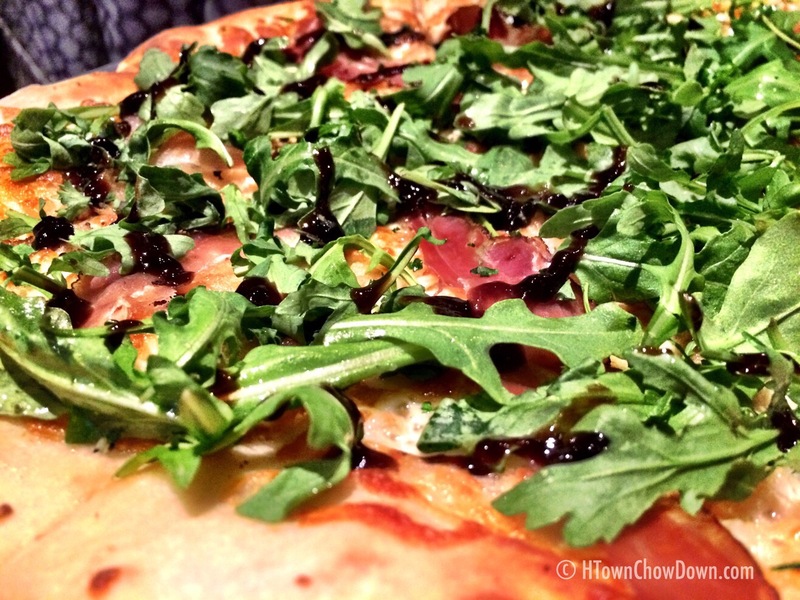 Pizza is a big deal at Crisp, and we sacrificed for our readers and sampled several of them. Crisp cooks its pizza in a very clever hybrid oven – it’s a stone-sided conveyor oven, offering the benefits of the intense heat of a stone oven alongside the consistency of a conveyor. We think it’s a great solution to problem of improperly cooked pizzas coming out of fancy ovens (hello, Grimaldi’s, we’re looking at you). But to us, it’s all about the results, so we started tasting some pizza. First up was The Dragon’s Pizza Pie, an outside-the-box creation topped with Gulden Draak poached apples, gorgonzola, prosciutto, arugula and balsamic syrup. We’re fans of this style of sweet/salty/smoky creation, as long as the ingredients are balanced and the kitchen executes a properly cooked pizza. The kitchen didn’t let us down. The result was successful; light, tangy, with the zing of the poached apples balancing the slightly sour gorgonzola and the smoky prosciutto. The bitter arugula and sweet balsamic completed the flavor profile. The crust was light, crisp (pun intended) and very tasty. We approve. Next up was another signature pizza, San Fran’s North Beach. Setting the stage are high quality pepperoni, rosemary ham, fennel sausage, olive, a hint of chili flake, small tomatoes and their housemade red pizza sauce. The seasoned meats are the centerpiece here; they elevate Crisp’s take on a meat lover’s pizza to the next level, with complex flavors that meld together masterfully. All in all, we’re big fans of Crisp’s pizzas. 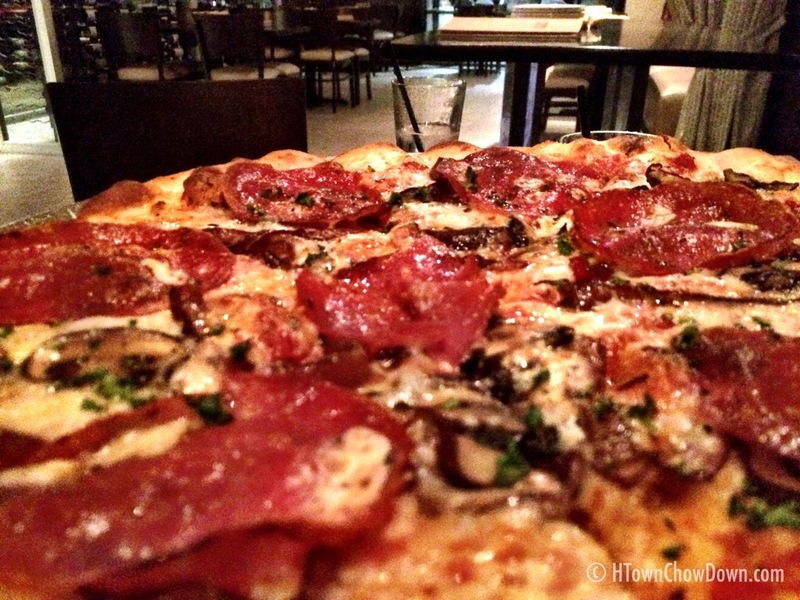 Clever combinations of unique ingredients, a flavorful crust, and careful execution are a winning formula. Even though we were nearing a food coma, we wanted to sample a few more options on Crisp’s menu. Next up was a southern specialty with a Crisp twist – Shrimp and Polenta. 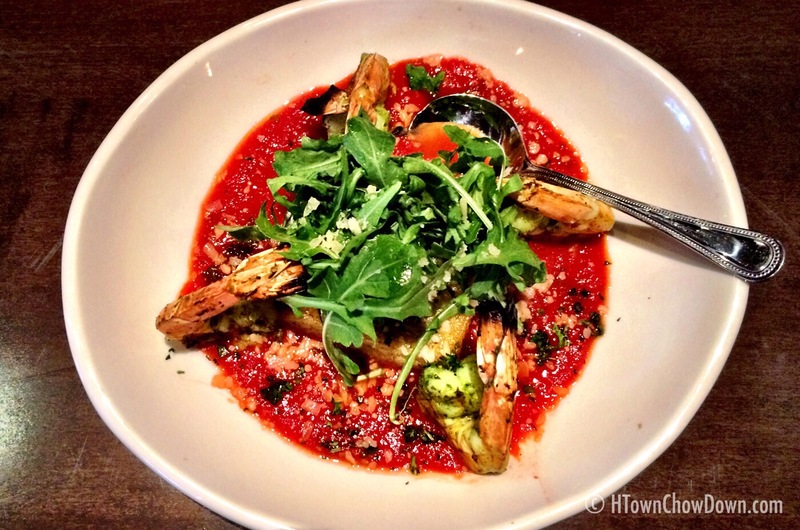 The formula: Nicely sized grilled shrimp, crispy polenta with smoked bacon, fresh basil, and roasted garlic tomato sauce. 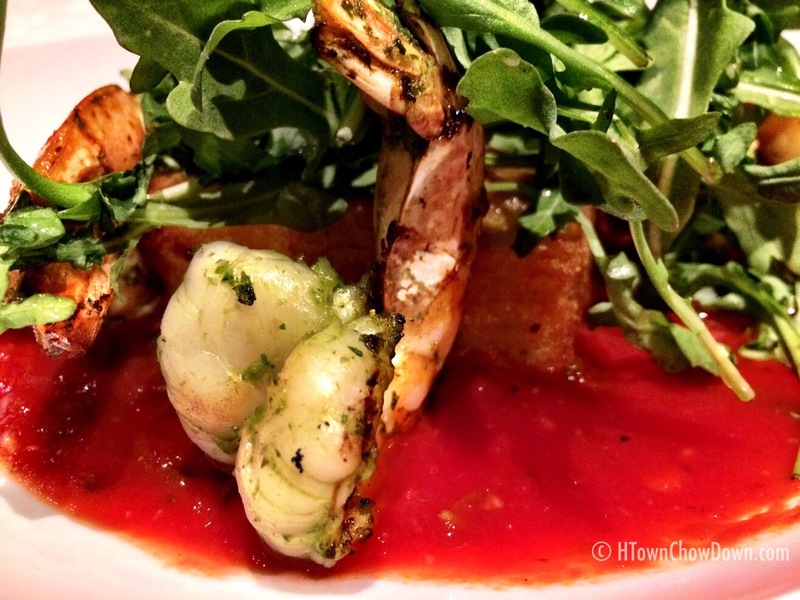 This dish highlighted the kitchen’s deft touch – the perfectly grilled shrimp and the savory, smoky, bacon polenta were balanced by the zing of the garlic tomato sauce. As much as we enjoy traditional shrimp and grits, we find Crisp’s riff on the classic to be a delicious variation. Another interesting spin on a classic is Crisp’s Baked Texas Goat Cheese & Marinara. 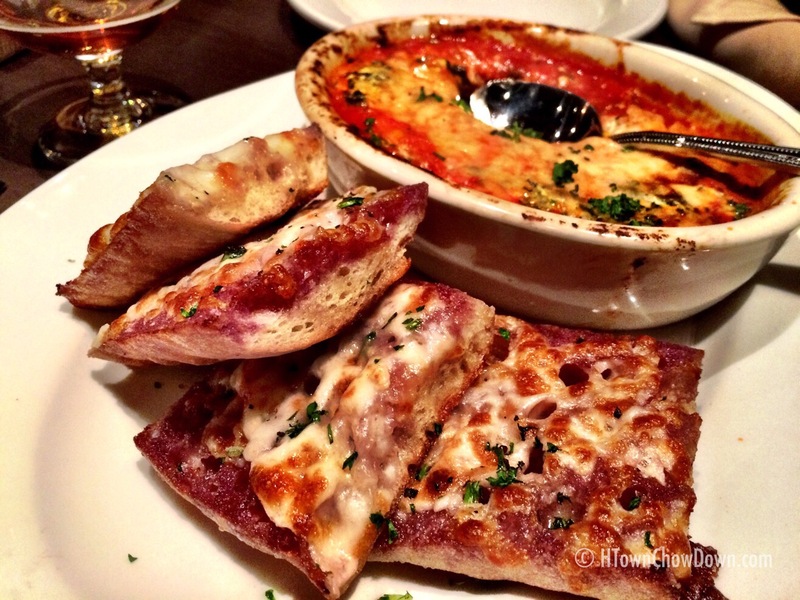 A bowl of Crisp’s tangy marinara is topped with a mound of creamy goat cheese, and served with their Drunken Garlic Bread, which is soaked in wine, topped with mozzarella, then lightly baked. The tangy marinara sauce is eclipsed by the flavorful drunken bread; the combination of both is tangy, creamy, rich and flavorful. Finally, we sampled an intriguing entree. Called Surf & Turf Risotto, it consists of caramelized scallops, short rib risotto, with asparagus, spinach, and a veal stock reduction. Again, Crisp’s deft handling of seafood is apparent. Scallops are gently caramelized and have a great texture; the chewiness that overcooked scallops can exhibit is blissfully absent. The beefy flavor of the smooth risotto is front and center, and the result is a nicely executed entree that we can easily recommend. Throughout our several visits to Crisp, we’ve been very pleased with the service from the friendly, well-trained staff. Everyone from the quirky yet charming hostesses to the smoothly professional wait staff to the chef and management team are helpful, engaging, and enhance the experience at Crisp. 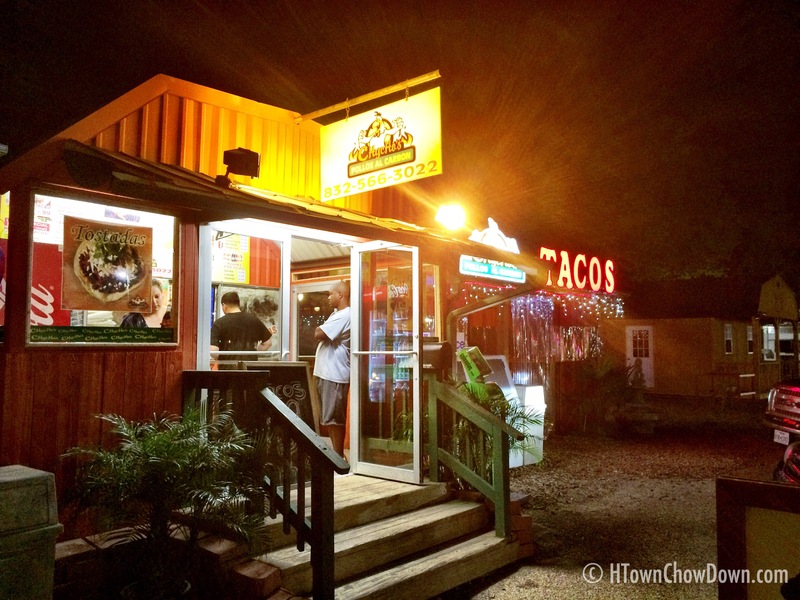 When successful Houston restaurants venture up I-45 to open a Woodlands location, the results can be mixed. In many cases, the Woodlands outpost doesn’t live up to the reputation of the original. Under the watchful eye of Chef Franz Garcia, Crisp’s kitchen turns out a variety of interesting appetizers, entrees, and pizzas, and executes them with verve and the all-important consistency. Service is professional and friendly, and the environment is cozy and comfortable. 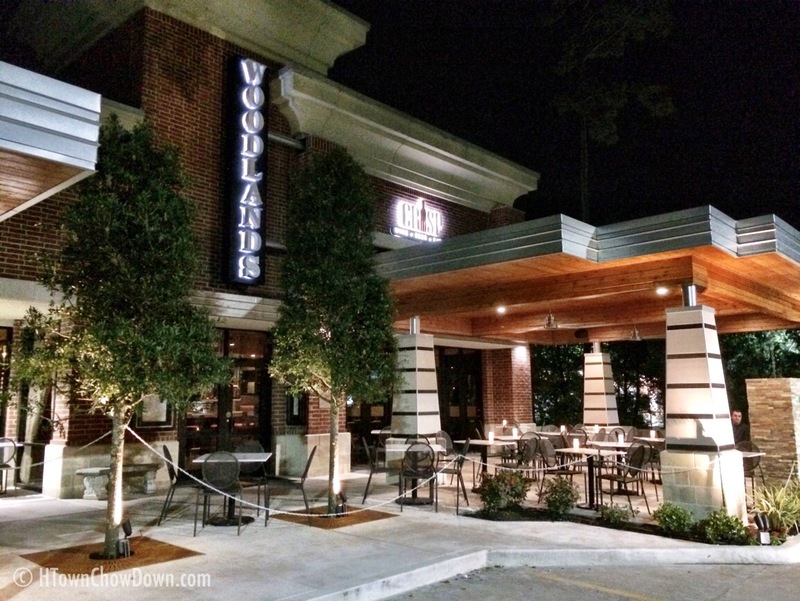 In short, Crisp is an excellent addition to the Woodlands dining scene, and we expect that the staff will soon tire of seeing us frequently in the future. 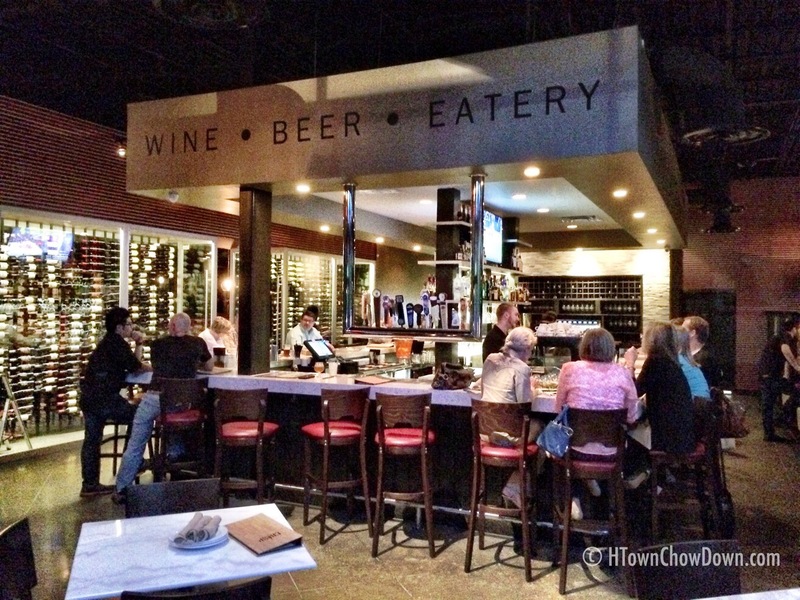 Note: HTownChowDown contributor Kim Bellini has also reviewed Crisp, in her excellent I Chew and Review blog. Here’s Kim’s review of Crisp.